The chaos and carnage in Twickenham on Saturday night was unquestionably the high point of week two in this simmering World Cup. The compelling and mystifying –because frankly how in the world did Wales win- contest provided exactly what we all expected with the already battle-scarred Welsh forced to reach deeper than most thought possible. Gutsy and intensely composed as the Welsh were in the final quarter, England have massive questions to ask of their leaders, both on and off the field. As many had noted beforehand England’s team selection suggested a desire to stifle their opposition rather than playing to their own strengths. Wales are bloodied and will need incredible resilience to turn around for Thursday’s encounter with Fiji but Gatland, like him or not, has engendered an incredible sense of desire and character within his Welsh squad. The idea abounds in this professional era that players are no longer driven by passion but by a natural professional drive to win. Gatland has long been criticised for his over-reliance on feeding his players emotions but this weekend he worked his players into a perfect frenzy. With bodies strewn across the pitch and an almost unbelievably patchwork backline out there, Wales’ character and passion were to the fore. The danger with this approach, of course, is that players can’t simply be expected to call on these deep resources of emotion each time they require a herculean effort. Nonetheless, when the situation required it last Saturday evening, a logically inferior Welsh side were able to out battle their more vaunted hosts. Ireland -remarkably in front of a world record attendance for a Rugby World Cup- easily and expectedly downed a limited Romanian side with the back three, in particular giving Joe Schmidt serious food for thought. With Rob Kearney in doubt for next weekend, this same back three may well be asked to take the field again although at this point it’s a coin toss between Tommy Bowe and David Kearney for the right wing slot. 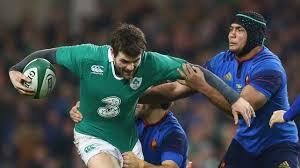 The most intriguing aspect of Ireland’s performance has been the criticism aimed in the direction of Jared Payne. The converted full-back has obviously been under intense scrutiny since replacing Brian O’ Driscoll in midfield, a truly unenviable task no matter who you are. Payne, though, appeared to have ridden out the storm, most recently receiving the endorsements of none other than O’ Driscoll and his midfield partner of many years, Gordon D’Arcy, both of whom acknowledged Payne’s outstanding defence and distribution skills. On Sunday evening, however, (Irishman?) Matt Williams lamented Payne’s complete lack of form, suggesting Darren Cave would be a suitable replacement in midfield. Worse still the rest of the panel were inclined to agree with him. Now with all due respect to Cave, who is a fine player, his best moments against Romania came in the second half, against a team not exactly renowned for their strengths in midfield. Payne was by no means outstanding on Sunday and his kicking is pretty abysmal judged against any standards. But, given that his kicking game needs to improve, he was right to experiment during those games in which Ireland have virtually no chance of losing. Look back to the defeat in Twickenham last month and you will recall that Payne was the outstanding back on the Irish team. Frankly we’d side with the guy who steps it up against the better sides, notwithstanding the fact that his performances in recent weeks haven’t really been all that bad. Jared Payne is the best available distributor and defender at outside centre at this moment in time. Darren Cave and Keith Earls though able replacements are not superior second centres to Payne. Robbie Henshaw may ultimately be the man who to naturally fill this position, indeed one hopes so, but right now we are only concerned with the next five weeks. One can’t help but wonder if there is an underlying antipathy allied with an increased level of expectation towards Payne based solely on the fact that he is a naturalised player. For years, we have looked down our noses at the All Blacks, Australia and more recently England for their recruitment of perceived rugby mercenaries. These players, wherever their place of birth, and their adopted nations are simply taking advantage of an IRB rule. Their performances should not be held to a higher standard and nor should they be subjected to the South Park treatment. Jared Payne’s performances continue to be questioned by the media. In any event, the negative talk about Payne has been widely disregarded by those in the know –Darcy and O’ Driscoll- and earlier in the week those who matter. Tommy Bowe, in an interview with The Irish Times indicated that Payne clearly has the backing of his peers while indirectly suggesting that Matt Williams’ views are perhaps best sprinkled with salt. Or at least that’s our interpretation. Williams doesn’t seem to be the most popular pundit, not helped by, amongst other things, his Colin Montgomerie- like ability to insert ‘I’ and ‘me’ into every answer, even when the question is not remotely related to him. Moving on, Ireland go to East London on Sunday to face Italy knowing that at last the intensity is going to be ratcheted up. Sergio Parisse’s return is of immeasurable value to Italy as heretofore they have been really poor and only snuck by Canada last weekend. The Italians came into the tournament in poor form and don’t seem to have escaped their funk. Parisse is of monumental importance however and by simply playing he has an uplifting effect on those around him. Statistics obsessed observers, who are ten a penny nowadays, naturally prefer to rely on measurable data and often balk at the idea that totemic players- McCaw, Parisse and O’ Connell- can improve the performance of those around them by their mere presence on the field. There is room for a lengthy debate on this, but our main point is that Sergio Parisse will be more than a world-class number eight on Sunday. Simply by returning to the fold he brings renewed, infectious vigour to his teammates and forces them to try and raise their level of performance to the lofty standards of their captain. This, however, will not be enough. Ireland have been quietly efficient thus far and all thirty players who have taken the field in the tournament have acquitted themselves well. Selection headaches have arisen as a result of an excess of quality performers as opposed to the 2007 issue of ‘where have all the good performers gone?’ It appears that Robbie Henshaw, an injury-enforced non-participant thus far, will make his World Cup debut alongside Payne, though Payne’s bruised foot may not heal in time. While the squad possesses an abundance of converted centres it would be preferable at this stage to have the first choice pairing together. The balancing act at loosehead prop may see the unfortunate Jack McGrath shifted to the bench, but a fit Cian Healy will be extremely difficult to omit. Along with Sean O’ Brien and the surging Iain Henderson the Leinsterman provides a world-class ball carrying option and breaching the gain line is, of course, absolutely crucial. Another fifty-odd minutes for Healy would surely see him primed to go deep when Ireland will need him most against the French. The back three also offers various conundrums, with all six players staking a valid claim to a starting jersey. Rob Kearney, the incumbent full-back, probably won’t be risked on Sunday meaning the increasingly impressive Simon Zebo will be entrusted with the role of minding the house. While Luke Fitzgerald impressed in the Six Nations finale his chances may be damaged by an appearance at inside-centre against Canada. That, and the fact that Keith Earls is probably playing the best rugby of his life. A confessed self-doubter the Limerick man looks incredibly confident and happy in his skin these days. A neutral observer would think that he is a lock for the number eleven against Italy, and perhaps beyond. If Payne is out, expect Earls to move inside and Fitzgerald to fill the number eleven jersey. On the other wing, there is a little to choose between David Kearney, whose form of late has been outstanding, and old favourite Tommy Bowe. Bowe’s form had been patchy at best, plummeting to its nadir in Twickenham last month. However, last Sunday he performed like a man with a point to prove, dominant in the kick chase and finishing well twice, particularly for his first score, when he powered straight over the top of his opposite number before grounding the ball in the tightest of spaces. Kearney is also a fantastic competitor in the air and he, more than any other back in the last two months, has showed menace and ambition in virtually every carry. It would be cruel on the Louthman to miss out, but it will prove extremely difficult to omit a rejuvenated Tommy Bowe. Admittedly though Bowe has only found form in the last week so the likelihood is that whoever has gone better in training this week will be selected. Never has an Irish coach been stuck with so many difficult though welcome selection issues. Credit here of course needs to go to Joe Schmidt and his coaching staff for developing a genuinely deep squad. There seems to be a near perfect balance of competitiveness, ambition and camaraderie. Time for the serious stuff now though. And, with a little bit of luck Joe Schmidt’s opinion will hold a little more sway than Matt Williams when it comes to team selection. * At the time of writing there is major doubt over Jared Payne’s participation on Sunday. Per The Irish Independent, Keith Earls will be Payne’s likely replacement.